I think Bennett loved these Elmo Birthday Invitations best of all. He still likes to look at them a whole month later. They were so easy to make thanks to the Cricut Machine! The Sesame Street Font Cricut cartridge does all the work for you! Cut all the pieces and simply adhere them together. I cut them to fit in a 5 x 7 envelope. I cut them out at 5 inches. Last, I used Microsoft Word to type the party information and printed it out on regular copy paper. I attached the information to the back of each Elmo cut-out using a piece of washi tape in opposite corners. Our church has what you may call “care groups” which we call Shepherding Groups. We are shepherds to a group of people from our church (our flock) and send them greetings and pray for them throughout the year. Each year I try to find a new Easter card to create to send out to our flock. I found this year’s card idea on Pintrest from Sassy Dealz. I thought it was cute and I had the perfect little 22-month old handprint to make it! Press that cute pudgy hand firmly near the top left of the folded white cardstock. Now just attach the pieces to the card as seen below. Ta-Da!!!! I just love the handprint sun! I added a few details to dress it up: Happy Easter stamp and a metal swirl. These are the Valentine’s Day treats we made for the grandparents from Will. First, I took pictures of Will smiling, puckering up and blowing a kiss. I used Pic Monkey to make a collage. I then printed the collage in colored ink on white cardstock. You have to make sure that the collage prints at the bottom of the paper so it can be folded over the bag of candy. Fold the cardstock in half. Fill a snack sized zipper bag with Hershey Kisses and seal it. Staple the cardstock picture collage to the top of the bag. That’s it — easy peasy! Bennett’s card was a little more involved, but it turned out so cute, I think. Oh the fun of trying to get a painted hand print from an 8-month old baby! He did pretty well, and we didn’t even get paint all over the place. I decided to paint the red paint on his hand rather than dip his hand in a pool of paint. It was a good call! I cut the card out of patterned cardstock. I found the speech bubble image on one of my Cricut Cartridges and cut it out in white cardstock with a red shadow piece. I used a black marker to hand write the messages on the card. 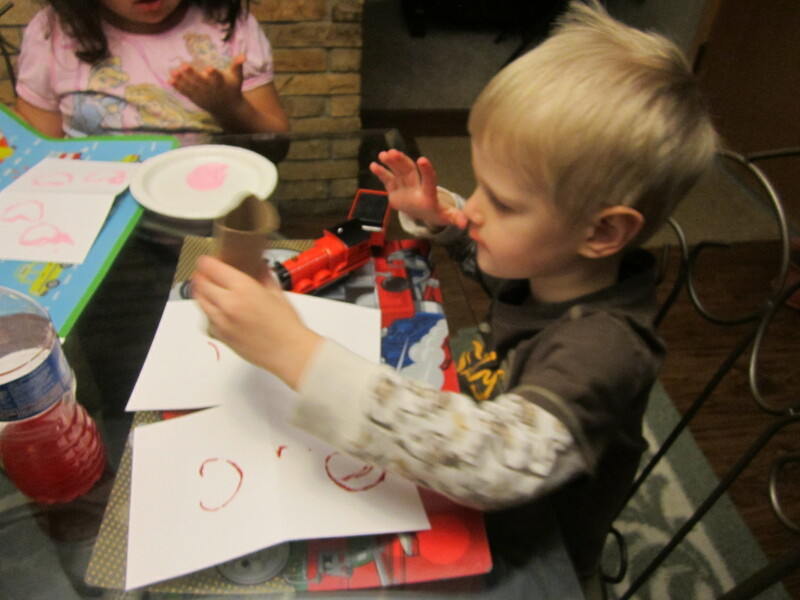 I cut around Bennett’s paint handprint leaving a white border. I also cut a white heart out of paper and glued it on the handprint. Using the handprint as my measuring piece, I cut a picture of Bennett in a circle that would be covered up when the handprint laid on top of it. I also cut a small rectangle out of white cardstock to make the handprint piece movable. I folded the white rectangle in half and glued one end to the back of the handprint and the other half to the back of the picture. Last, glue the picture to the card. Make sure you glue it low enough so the handprint is in the correct place on the card. I also wrote a note on the back side of the handprint. Two fun cards from two adorable boys for two sets of wonderful grandparents! Since Valentine’s Day is next week, we dug into our collection of Valentines’ books. We picked one with one of our favorite book characters, Franklin! 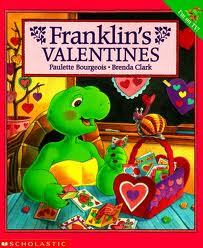 We read “Franklin’s Valentines” by Paulette Bourgeois. On Valentine’s Day when Franklin is in a rush to get to school his valentines fall out of his backpack when he’s running for the bus, but he doesn’t realize it. When it is time to pass out valentines, he has none. Franklin learns both what is like to be a friend and the gift of unconditional love in a friendship. We had our friends Rylee and Drew over for supper the other night and decided it was the perfect night for them to join us in our project fun! We, of course, had to make valentines! 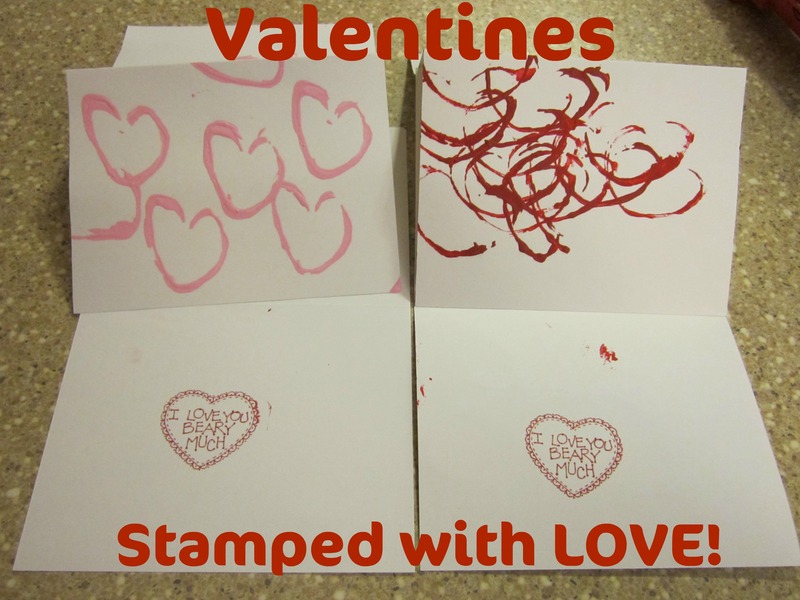 This project using heart stamps came from Pintrest via Rust and Sunshine. Will’s 4 valentines went out in the mail today for some special family members! 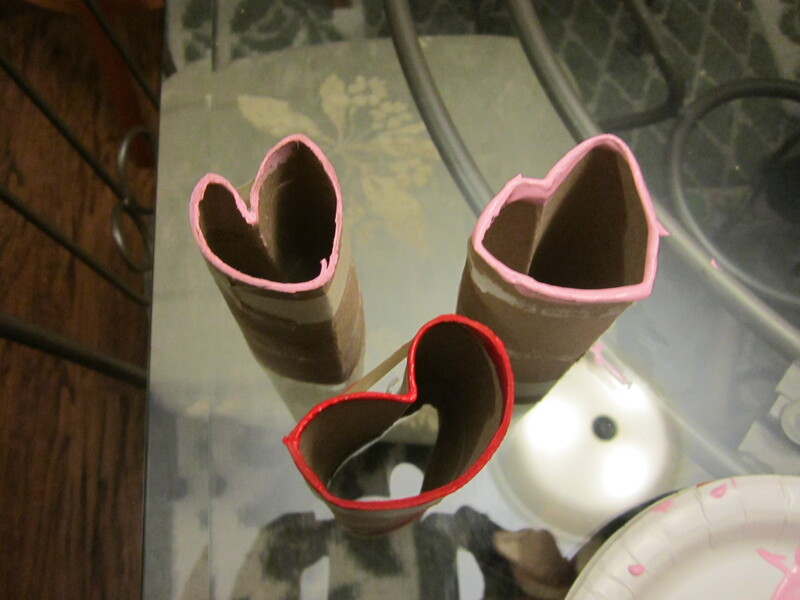 To make the heart stamps take a toilet paper roll and crease it in half lengthwise. Then bend one side on the crease inward to create the rounded parts of the heart. Secure the heart into place by wrapping a piece of tape around the toilet paper tube. Now you are ready to stamp! For more stART ideas visit A Mommy’s Adventures.